I thought it prudent that I purchase myself a new dririder outfit before we head to NZ as my old one must be approaching 15 years old or more. My old dririder didn't leak last time I used it but I don't think I want to chance it. A kiwi I met recently said that I should upgrade as it doesn't just rain cats and dogs in NZ it rains cats and dogs, cars, houses and small continents. I didn't need to think about it too long as Milford Sound gets over 7 meters of rainfall each year. Yeah that's lots of cats and dogs. Is that the all in one type of thing. Looks spiffy I have to say, last time I rode through rain I was slightly damp by the end of the ride up top, might have to think about something like this sometimes soon I guess. 7 meters!!! wow, we'd kill for 7 mm at the moment. Hi Brenda, yeah its a one piece suit big enough to slip over my leathers. Can be a bit tricky getting it on when suited up. Yeah 7m is a lot of rain isn't it. I think we've had our driest ever january month here. 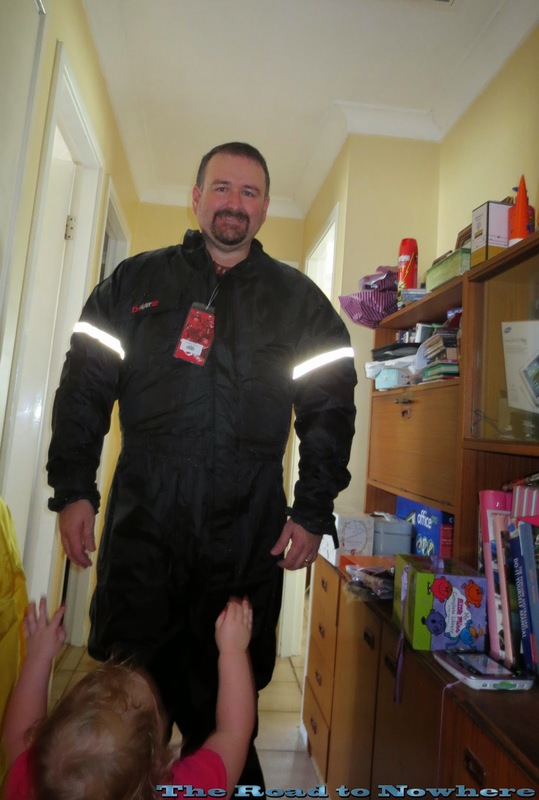 Nice rainsuit. You will so appreciate that when/if you hit rain in NZ or at home for that matter. No if, just when. I'm 100% sure we will hit rain in the 10 days we are there. The Milford Road is probably my favourite bit of road. I've done it wet (road is good in the wet) and dry and it's just as much fun in either condition. If you are going out on a boat trip then hope for rain before you go so that it charges up all the waterfalls. Take insect repellent or the sand-flies will take the flesh from your bones. I've done the boat tours at Milford and at Doubtful Sound and they're both great but I'd particularly recommend the day trip out of Manapouri that takes you down to the power station as well as a tour of Doubtful Sound. Don't worry Andrew your not alone, I've been soaked in a dri rider as well. Sometimes you just can't keep the water out. I've driven the Milford Road and all the way along a was wishing I was on a bike. We will be riding it whether it's raining or sunny. howd did they find that much plastic to sew together? Someone looks pretty impressed with the suit. Is she worshipping you or just pointing out that you left the tag on it? Oh, yeah......WOO HOO!!! 2 Days to go!!! !